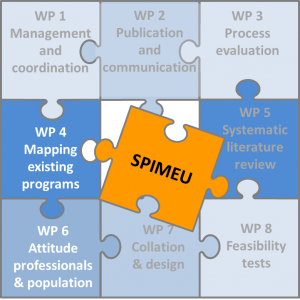 The SPIMEU project aims at contributing to the reduction of cardio-metabolic morbidity and mortality in EU Member States by establishing the feasibility of implementing innovative evidence based selective prevention actions in five EU Member States representing various health care systems. In addition, the SPIMEU project will provide a toolbox for tailoring selective prevention actions in all EU Member States. This website is part of the project / joint action ‘663309 / SPIM EU’ which has received funding from the European Union’s Health Programme (2014-2020).